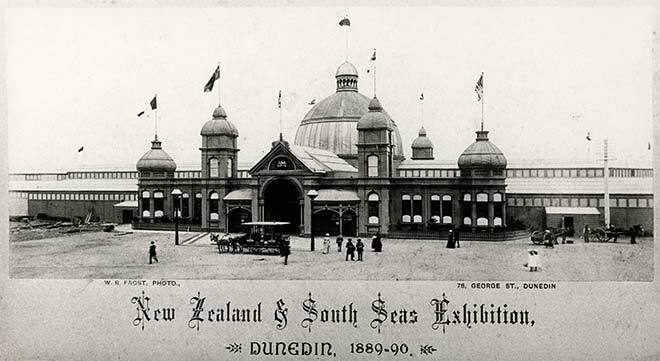 The New Zealand and South Seas Exhibition was intended as a commemoration of the 50th anniversary of British sovereignty in the colony. It was held on Harbour Board land on Anderson's Bay Road in Dunedin. The main entrance – shown here with its classical domes – was designed by local architect James Hislop. The exhibition ran over the summer from December 1889 to April 1890, and attracted 618,662 people (slightly fewer than the country's population at that time), many of them attracted by the amusement zone with its switch-back railway.